"You've got to accentuate the positive, eliminate the negative, latch on to the affirmative, don't mess with Mister In-Between"
So sang Bing Crosby in the old Mercer and Arlen song, and so would appear to be the lesson from this excellent new book from the hot American pollster Frank Luntz. For many British Conservatives, Frank Luntz sprang on to the scene when he was the first pollster to predict the potential impact of David Cameron on voters, when Newsnight commissioned him to research the appeal Conservative leadership candidates, on the eve of the 2005 party conference. DVDs of this presentation on Newsnight were famously distributed to Conservative MPs. However, he has been a fixture in the American political firmament for more than a decade. Luntz worked for Rudi Giuliani in his New York City mayoral campaigns, and advised Republican candidates in the elections from the mid 1990’s to 2004 that saw them seize control of the United States Congress for the first time in 40 years. To supporters of the Democrats in America he is the arch spin doctor, making words dance to the tune of Republican politicians, and tricking the voters into support them. Websites have been created publishing his memos and presentations to Republican candidates, and to watch out for Frank Luntz buzz words in play. But, as this book illustrates, his work helps to free political and corporate communications from jargon and confusion, in order to make it interesting, relevant, and even inspirational to its desired audience. This is a public service rather than linguistic trickery. However, there are three lessons in particular that should be constant companions for Conservatives on the road to the next UK general election. First, that ‘credibility is as important as philosophy’. David Willets recalled in the summer of 2005, that research in the build up to that year’s general election had shown that there was little point in the Conservatives promising tax cuts, as no one believed them. It is not just enough to believe that your policies and approach are right, but they have to be part of a constant and credible story that is true to who you are and where you are headed. Luntz cites Al Gore’s claims to have invented the internet, and that his romance with his wife Tipper was the inspiration for the book and film ‘Love Story’, as extreme examples of the incredible and unbelievable. This lesson is also at the core of the sub-title for this book – that ‘it’s not what you say, but what people hear’. People will interpret what you say, through their understanding of the person they believe you to be. Second is simplicity. Mark Twain once apologised to a correspondent for writing them a long letter, because he did not have time to write them a short one. It is always easier to talk at length on an issue, because it avoids the necessary thought and decision that goes into a short and precise statement. Luntz quotes from and recommends George Orwell’s 1946 essay, ‘Politics and the English Language’. This advises the reader to always cut out a word from a text if you can, and at all costs avoid jargon and long words. Too often corporate and political communication is rendered meaningless and unmemorable by poor use of language. And third is to speak aspirationally – ‘the language of hope and opportunity works with everyone’, he writes. The great communicators have always expressed a strong purpose. They have looked ahead to the ‘sunlit uplands of peace and prosperity’, built bridges to the future, had ‘a dream’. This aspiration has moved and inspired people. It has fostered a belief that the speaker is focused on the future, leading the way to a better world, and reaching out to take the audience with them on that journey. As an example of this he quotes from Margaret Thatcher, who said simply ‘I am in politics because of the struggle between good and evil. I believe that in the end good will triumph’. Damian Collins is the prospective parliamentary candidate for Folkestone and Hythe and Managing Director of Influence Communications, at M&C Saatchi. I just wonder if being simple is enough. If you take Reid's article in today's Telegraph where he, in theory, is talking about some proposed legislation, but, in fact he is just a sst up oportunity to smear Cameron. It's the same sort of stuff as the Sun's 100 "opinion formers" when anyone really knowledgable wouldn't trust Brown with anything. Wouldn't be surprised if the "opinion formers" don't exist and it's all part of a smear campaign with Reid. I agree with Damian, this is a fantastic book. Dr Frank Luntz is cheeky, urbane and very smart. It's not often that you're so engrossed in a quasi-academic book that you leave cups of tea undrunk or pans on the boil. This is a very accessible manual which in a swashbuckling way tells you how to get your message across. 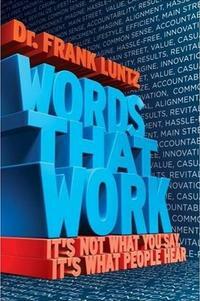 Luntz spends thousands of hours honing his messages in his dial sessions. (That's when people give immediate feedback on performances by pushing a button saying just how impressed they are at every point in a speech). That's how he finds the "words that work". He sums up in one paragraph what David Cameron must do.